Our Fair offers affordable retail opportunities to local distributors and agencies. Exhibits are to be setup between 1-5 pm on Friday and should not be taken down before 4 pm on Sunday. Consideration will be a first come first served basis and preference will be given to unique local and area vendors related to the agricultural industry. We try no to duplicate exhibitors. Payment for the total space must be received by July 31. Cheques payable to Bayfield Agricultural Society. No refunds will be given after July 31. No refunds for inclement weather, hydro outages, or factors beyond our control. 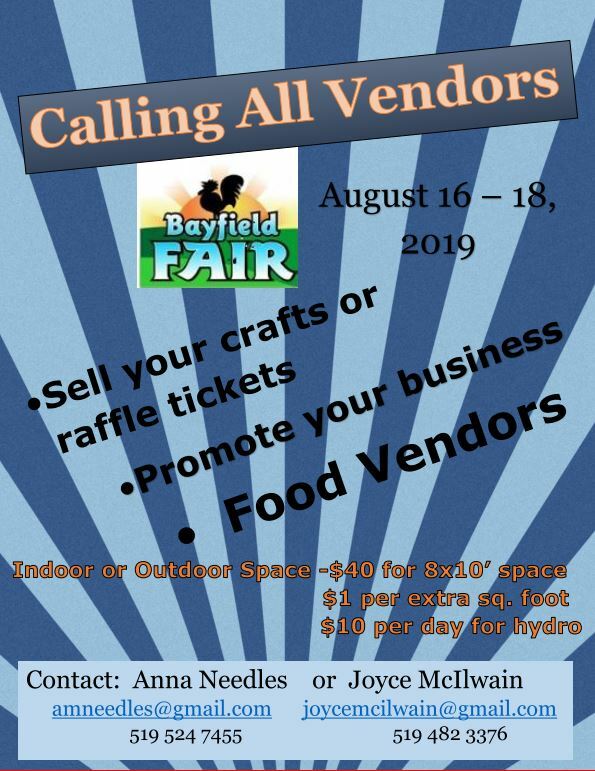 The exhibitor will not hold the Bayfield Agricultural Society or any of its members responsible for loss or injury during setup, the fair, or take down. Note: All exhibitors or concessions people will receive a receipt and 2 guest passes at setup time of the fair. Others working at their booth will have to pay entry.